Daniel Candeias is bemused after receiving a second yellow card against St Mirren. Manager Steven Gerrard has “no personal issue” with Willie Collum, a day after Rangers said they would make a formal complaint about the referee. The Ibrox boss called Collum “a good referee in general” and called for “common sense” to prevail following the fallout from Daniel Candeias’ sending off against St Mirren last weekend. Rangers failed in a bid to overturn Candeias’s second booking for an exchange with Anton Ferdinand. “We are all human,” said Gerrard. Rangers said the second booking – which came after winger Candeias was cautioned by Collum for celebrating his opening goal with fans – was “inexplicable”. However, with clubs only able to appeal yellow cards in cases of mistaken identity or simulation, the Ibrox club chose to appeal on the grounds of the former. Collum had been due to take charge of Friday’s Scottish Premiership match between Aberdeen and Hibernian but has been replaced with Alan Muir. The Scottish FA says Collum picked up a groin injury on Champions League duty on Tuesday and withdrew from the appointment before Rangers released their statement. “I think he is a good referee in general, he has been picked by Uefa to be a referee,” said Gerrard, who described Candeias’ second booking as “embarrassing” on Saturday. “It is my responsibility to support the referees and officials in this country. It is not a big talking matter. 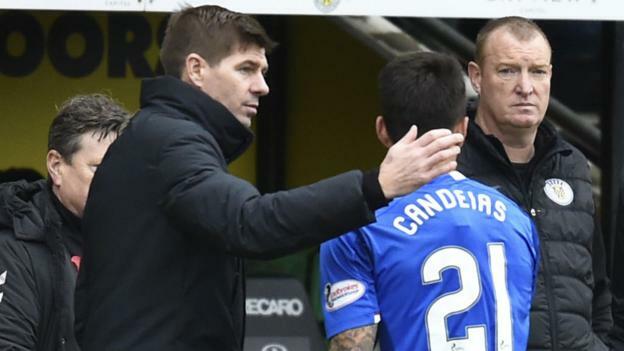 Asked if he had received an explanation as to why Candeias was punished for his exchange with Ferdinand, Gerrard said: “No, that’s an on-going matter. “You have seen the statement that the club have released. I haven’t got any more to add, only that I am disappointed with the outcome.